Designed for the selfie enthusiast, the moon white instax mini 70 from Fujifilm is a sleek camera characterized by a range of features for self-portraiture and sharing your instant credit card-sized prints. The camera's design incorporates a retractable two-element Fujinon 60mm f/12.7 lens that permits focusing as closely as 11.8" in macro mode. The optical real image viewfinder has a 0.37x magnification along with a target spot to aid with composition, and the front of the lens incorporates a small mirror to also benefit more accurate selfie compositions. 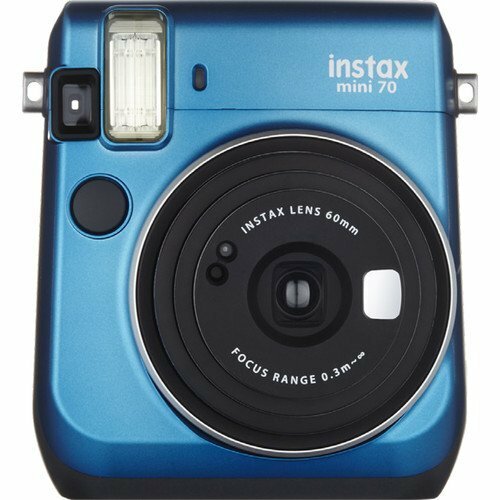 The Fujifilm Instax Mini 70 Digital Camera was added to the Digital Cameras category in June 2016. The lowest price GetPrice has found for the Fujifilm Instax Mini 70 Digital Camera in Australia is $85.08 from Amazon AU. Other merchants who stock it are Amazon AU, Camera-Warehouse, Dirt Cheap Cameras.